This year’s Enterprise Connect Orlando was the greatest in so many ways! Second, the general sessions were really great, and were playing to the largest audience ever at an Enterprise Connect Orlando event. Keynoters from Microsoft and Cisco advanced the scope of UC&C, while Google Cloud’s keynoter shared the company’s distinct approach to enterprise communications, Amazon Web Services (AWS) shared the company’s disruptive approach for contact centers, and -- wait for it -- Walmart’s keynoter, Joe Park, chief digital architect and VP for associate digital experience, provided some impressive examples of how to put communications innovations to work. You can watch all the keynotes on demand, and it’ll be worth your time, IMHO. In addition, the mainstage included several panel discussions with enterprise communications and IT leaders and three fireside chats -- short 15-minute interviews with top execs from UCaaS, CPaaS, and VCaaS challengers RingCentral, Twilio, and Zoom Video Communications, respectively. Third, Eric Krapf and Beth Schultz, the Enterprise Connect program co-chairs, did a great job of organizing the program to maximize value for the attendees. Most breakouts and panels were short, sweet 45-minute sessions, and the schedule deliberately allowed attendees plenty of time to focus on the Expo floor. For convenience, the EC team brought the conference program to the Expo floor too, with 20-minute breakout and sponsored sessions occurring in two presentation rooms, one at each end of the floor. 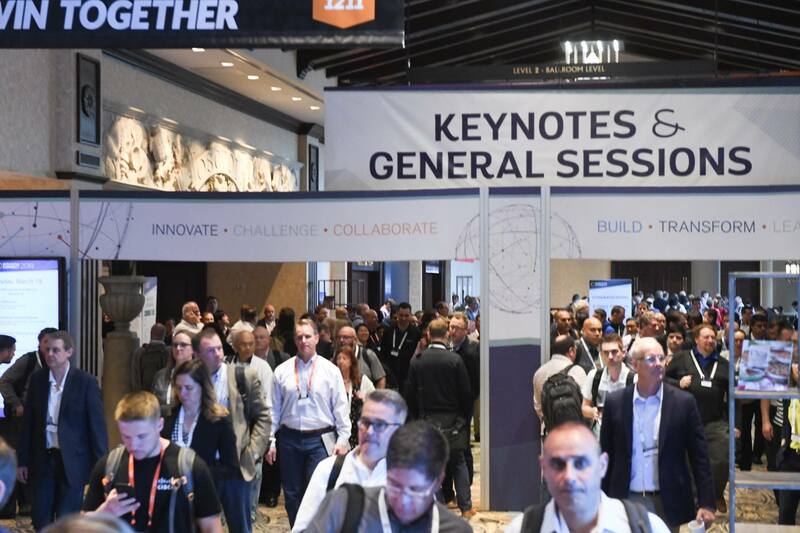 And, the breakouts all week were organized around nine topical themes, plus a one-day conference within a conference focusing on enterprise communications and collaboration in 2022, making it for attendees to prioritize based on their interests. And, of course, there were plenty of social opportunities, with food and beverages in the Expo at the end of each day along with a welcome reception party on Monday evening and an appreciation party on Wednesday evening. Overall, EC19 was a great time. Now, here are 10 observations about the themes that I found most evident at EC19. 1. Collaboration is the new marketing tag for employee communications packaged into various forms of online team work environments that include varying media types and styles of communications. Each vendor’s vision is that employees will certainly want to have these wonderful tools so they can communicate at work like they do on Facebook at home, and so that they can always have video for real-time interaction. Vendors are applying words like “intelligent” and “cognitive” to these workspaces, though it’s not entirely clear whether the software or the employee will be more intelligent or cognitive. It does seem clear that, just as with Facebook, various forms of back-end data capture and analysis will occur in these workspaces to drive the emerging use of artificial intelligence (AI) and machine learning (ML) in software products. These ideas produce great visionary presentations but may be quite a way from reality for most enterprises. Microsoft may earn a few extra points with its recognition that not all workers (perhaps barely half of all workers based on U.S. workforce data) actually work in that type of environment. Microsoft is addressing this with frontline worker tools, such as an app built in Teams for the benefit of shift-based workers, as presented in its keynote. 2. Conferencing had a buzz of its own. Dozens of vendors showed mature and impressive cloud-based conferencing services (including conferencing in the collaboration tools noted above) or sophisticated conference room technologies. The visions and value propositions are continual improvement or even transformation of ever-present and time-consuming meetings. The results are in, and we have an exciting Innovation Showcase on tap this year at Enterprise Connect.